Long before gaining widespread recognition for his role as Richie on HBO’s Looking, Raúl Castillo’s acting career began in the fourth grade, when he auditioned for the school play and was cast as a guard with no lines. He was an active member of his high school’s drama department and went on to study playwriting at Boston University’s School of Theatre, where he wrote plays and entered them in the student playwrights’ festival every year. Three such plays, collectively titled Border Stories, dealt with life in Mexico just across the border from Castillo’s home town of McAllen, Texas. Only 37, Castillo already has an impressive number of acting credits to his name, having starred in plays, movies and TV shows. Besides his role as Richie in Looking, he played Andrew in 2013’s highly-anticipated adaptation of Rudolfo Anaya’s classic novel Bless Me, Ultima. When he’s not on stage in New York, he’s on stage in Chicago, most recently starring opposite Sandra Oh in Death and the Maiden last year. Castillo spoke with Gozamos about Teatro Vista’s presentation of Between You, Me, and the Lampshade (which he wrote), as well as the immigration issue, playwriting, and Latinos in theater. Just give us a sense of what Between You, Me, and the Lampshade is about. I know it’s about an undocumented immigrant who breaks into the trailer on the border. Are they hiding the girl from the community? Or ICE? I don’t think she’s hiding her so much as stowing her away until she figures out what to do with her — “she” being the principal character, this single mother Jesse. I understand you grew up on the border. Does that kind of thing happen a lot? I don’t know how much it happens. I think it just came from my own imagination. But growing up on the border, where a lot of people cross over easily, such a confluence of cultures. There’s a constant flow of people back and forth, and the border has such a porous quality to it, less so now post-9/11. I grew up in this town called McAllen, and the Rio Grande valley is pretty much a hub for illegal immigration. So it’s a phenomenon I’m definitely interested in exploring as a writer. Tell me a little bit about growing up in McAllen, especially as it compares to New York City, where you’re now based. 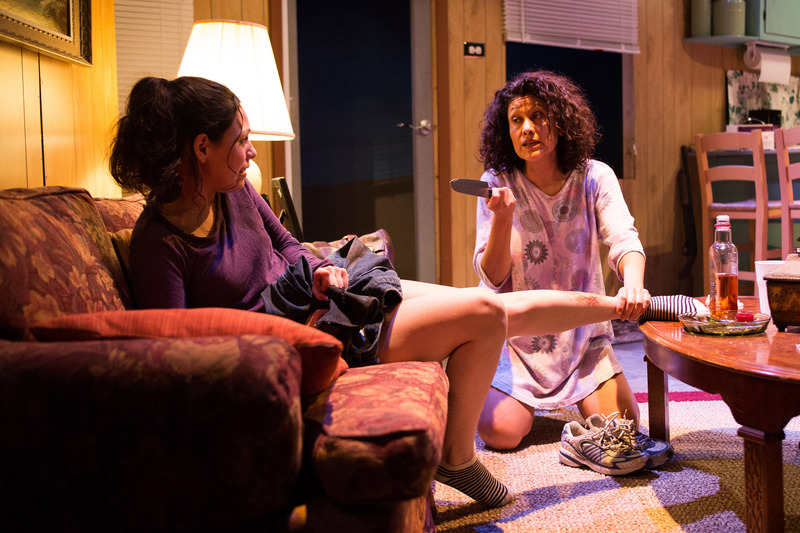 What kind of things will a Chicago audience see in the play that tells of life on the border? It is a border story in a lot of ways, but I think undocumented immigrants are all over the country. And oftentimes it’s something that’s invisible. My goal is to portray one story and make it universal. I think those people that are in our communities — are a part of our communities, part of our daily lives — so often they go ignored and unobserved. So I think it very much pertains to the community in Chicago. I know there’s a big Mexican community here. Not that undocumented immigration is explicit to Latinos. I think it’s definitely across all communities, affecting all communities. Now you’re considered a playwright and an actor. Which do you consider yourself to be more, or does each inform the other? I don’t consider myself more one or the other. I like to think I’m a storyteller, and I think they definitely influence each other — the writing influences my acting, and my acting influences writing. I learn so much about the acting craft when I see my cast do what they do. Since you have plenty of acting credits to your name, what do you see as the differences between scriptwriting for something that’s going to be on a screen and playwriting for something that’s going to be on a stage? I think theater is language-driven. We have a great team of designers on this show — our stage designer, costume designer, lights, and sound — and they’ve done such great work, all four of them, in painting the world of this play. But I think the play also lives absolutely in the language, and that’s what theater is, really — it’s just bodies on stage telling a story. That combined with the audience. The relationship between actors and a live audience is integral to the experience of theater. That kind of communion between the elements is essential, as opposed to watching something on your computer or in a movie theater or on TV. Having been in plays in New York and in Chicago — you were in Death and the Maiden at the Victory Gardens Biograph Theatre last year — do you find anything different in Chicago audiences, in the way they react or receive something? Absolutely. I feel like Chicago has a rich tradition of cultivating new plays, new work. People are used to going to see new plays here, and I feel like they embrace it. And it’s such a great environment to be in. People really love going to theater here. In New York I always kind of feel like I’m going to see a rock show. I love New York. I’ve lived there for 20 years. It’s my home. But you go see a rock show in New York and everyone’s kind of standing around watching this rock band, and it’s so boring. [laughs] Go see a rock band in the Midwest and kids are dancing, throwing themselves around, and there’s an energy to it. I think New York is too cool for itself sometimes, and that can be frustrating. So it’s great to get out, to come to a city like Chicago. And also you find these actors that just dive into the work and are selfless in this really wonderful way, I feel really lucky to be able to come work here. This is my third time working in Chicago — I was also in Fish Men at the Goodman Theater in 2012, another incredible experience. And now to be here as a writer, it’s been a really wonderful experience. The audience has been really enthusiastic. It is a comedy, a dark comedy. And it’s certainly got its dramatic side to it. But it completely relies on an audience, and I think the actors seem to be really thriving now that we have these warm bodies and people responding with laughter and vocal reactions. Is this your first time working with Teatro Vista, and how has that experience been? It’s my second time — Fish Men was a co-production with Teatro Vista. It’s been a real joy. The actors, like I said, espeically with a new play — because it’s still being crafted, I’m still working on the script. It’s come a long way. Workshops were back in February, I believe, and we casted back in December. I wasn’t here for the auditions, but I received tapes of the auditions through computer. My wonderful director Ricardo Gutierrez and I had conversations about the cast, and I couldn’t be happier with this group. Teatro Vista is a wonderful company, and they continue to do all this great work. I’ve been watching them, keeping my eye on them, for many years. And to be able to bring this play to life with them, I feel really honored and certainly lucky, because it’s been a great process. They’ve been so giving of themselves to the play, and they think of the story first and foremost. And as a playwright, I couldn’t ask for a greater gift. To piggyback off that, what do you see as the current state of Latinos in theater. Is it the perennial story of “we’re coming up, but there’s still a long way to go”? Yeah, I think we need more diversity, not only of Latinos, but people of color. Certainly women. But there’s a lot of exciting work. I just got back from New York, and I went to see Hamilton at The Public, written by Lin-Manuel Miranda who wrote In the Heights. And that show was just electrifying, just to be in the audience and witness it. There’s all kinds of great writers out there. I think there’s an event coming up called Carnaval based on the Latino Theatre Commons. It’s a coming together of Latino theater practitioners in a way that — I’m sort of on the outside of it, but even my impression from the outside is that people are coming together to get the work out there and be proactive, not waiting around for a particular opportunity but creating the opportunity yourself. You have to fight from the inside and from the outside, and people are doing that. It’s an exciting time, because a lot of wonderful Latino writers have already paved the road for our and newer generations. So we don’t really have a choice but to bust the door down and make ourselves heard. About the play, what are some of its surprising aspects? What do you think the audience will be suprised by? I would hope the play deals with these issues — such as undocumented immigration — and approaches them through a less didactic way and through a more three-dimensional, human portrait. I hope they can walk away with that. Kind of laugh and cry at the same time? Absolutely. There’s a lot of humor in the play, but it also tries to shed light upon the outcasts in the world. You obviously have people living marginalized lives, and it doesn’t have to be that way, shouldn’t be that way. Especially when that community deserves so much respect.